War Museum is in the Background. Your website was just brought to my attention. Congratulations on a superb job. 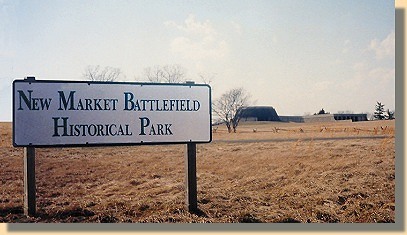 Particularly, thank you for your comprehensive photo "tour" of New Market Battlefield State Historical Park. We appreciate your willingness and efforts to share our heritage with visitors to your site. As a part of Union Lt. Gen. U.S. Grant's 1864 major offensive, Maj. Gen. Franz Sigel moved up the Shenandoah Valley** along the Valley Pike (Now Route 11) with approximately 10,000 men. He had orders to destroy the railroad and canal complex at Lynchburg. The Shenandoah Valley was crucial because it provided essential crops and meat for the Confederate Army of Northern Virginia and was an easy path for invasion by either the North or South. 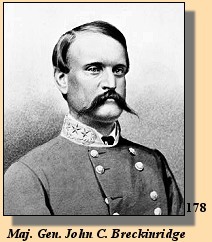 To meet the Union army, a smaller Confederate force of 4,500, commanded by Major General John C. Breckinridge, marched north along the Valley Pike toward New Market. Breckinridge hoped to defeat Sigel without using the 257 Virginia Military Institute (VMI) cadets who had recently marched from Lexington and were now under his command. Arriving at New Market, Breckinridge found the Yankees dug in across the slopes of nearby Bushong's Farm. The Confederate general tried several times to lure Sigel into an attack, but the Northern commander did not move. Accordingly, on May 15, 1864, Breckinridge ordered a general assault against the Union high ground. During the assault, the Unionists counterattacked , almost destroying the center of Breckinridge's line. This forced Breckinridge to call upon the VMI cadets to reinforce the 62nd Virginia Regiment of infantry. With the addition of the Cadets, the 62nd increased to approximately 800 troops. This force was sufficient to drive off the attackers and the Southerners quickly countercharged. During this charge, the cadets passed around both sides of the Bushong farm house and encountered Federal fire in the orchard behind it. Most of the cadet fatalities occurred in the orchard, now known as the "Fatal Orchard". Past the orchard, the cadets and regulars attacked through the "Field of Lost Shoes", a wheatfield made so sodden by the rainstorm in progress that the soldiers's shoes were literally sucked from their feet. The Confederate charge continued to the top of Bushong's Hill, where the Southerners overran the Federals and drove them from the field. Threatened by the Confederate cavalry on his left and rear flanks , Sigel withdrew his forces and retreated down the Valley to Strasburg . He was soon replaced by Union Maj. Gen. David Hunter. ** Going "up" the Shenandoah valley means going South; going "down" the valley means going North.